Ahoy All! T’is your Old Mate Roger the Red here to share with ye a couple of the Rogues most recent activities. On June 27th of this year a good handful of us strolled Belmont Pier in Long Beach for the annual “Pirate Daze” event hosted by Alfredo’s Beach Club. 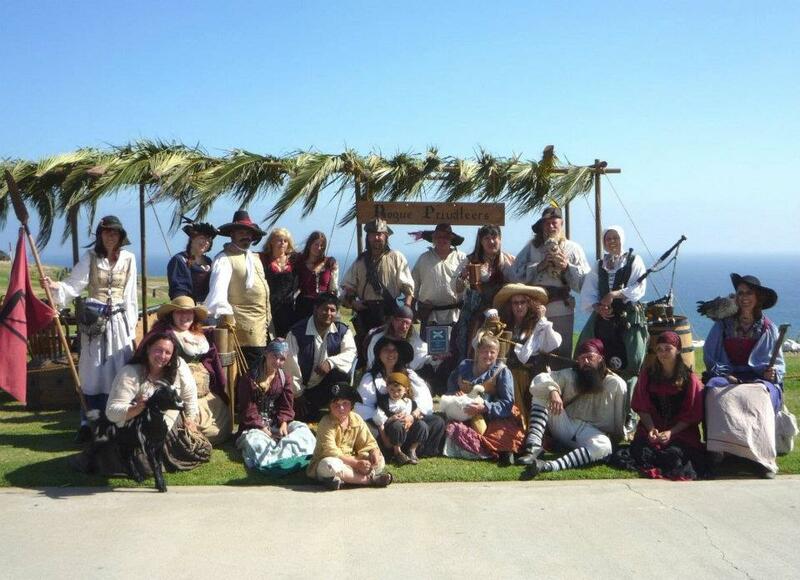 This was a festive gathering of many crews and a chance to share good times with our friends in the Pirate Community. It was a cool and windy Saturday-we even got a brief sprinkling of rain-a perfect day for laughing and shopping the vendors then grabbing a drink and bit o’ grub while listening to good live music from Favorite Band “The Pirate Charles” and other acts. There was a ceremony held by “The Order of the Leviathan” an honorary group that our Quartermaster Duncan McGregor is a candidate to join this year-We all wish him the best and urge those in the Community to vote for him-at least one time, if not more. It was a raucous mix of Pirates and Privateers with the Public, plus a smattering of Mermaids, Steam Punks and Faerie Folk, all enjoying a scene filled with fine fellowship and good-natured carousing. This is a free annual public event and we heartily recommend it to all. A half dozen and more of us spent an all American 4th of July at the Fort Moore Pioneer Memorial 1847 Independence Day Re-enactment & Salute Los Angeles Day. This locale was on Hill St. in Downtown L.A., the site of the first independence Day Celebration after California gained statehood. 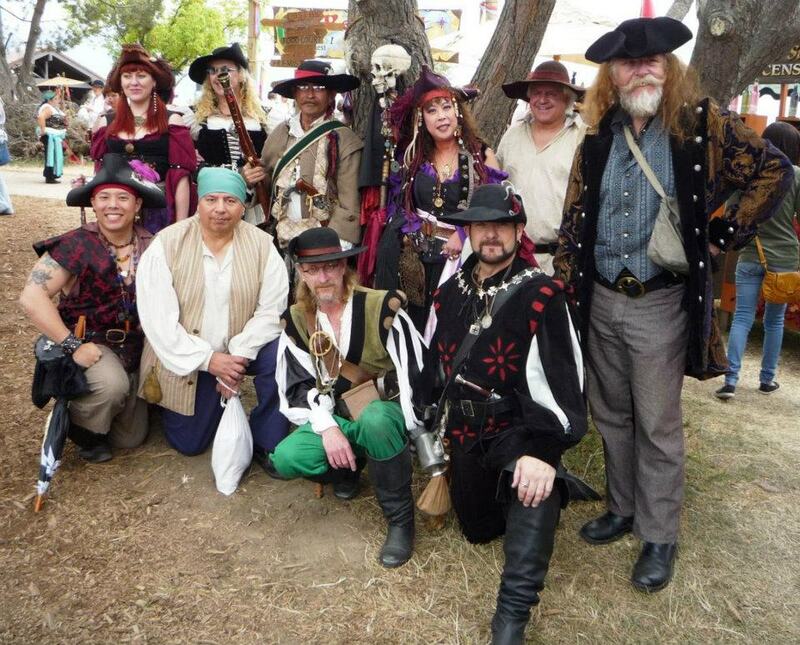 The Rogues were there, this time in Californio mode, to crew a Cannon Salute under the direction of our Quartermaster. We blew off eight rounds throughout the ceremony-setting off car alarms with each of our two 4 pounders loud reports. I myself also served in a Musket Salute to the 28 states of the United States at the time of California’s admission- with a few misfires, aye, but we got through it. Our Quartermaster and Gun Captain, Dan McGrew-aka Duncan McGregor, was named Honorary Fort Moore Garrison Artillery Specialist and provided closing remarks as well. It was a fine ceremony-a little strange to be firing our guns, dressed in early 19th century garb, next to a busy street in Downtown Los Angeles. But a little strange is how we likes it-sometimes. We Rogues have a Private Live Firing Event in the near future-(with real ammo this time!) possibly cannon crewing on a Tall-Ship, and a gathering of our Confederate Blockade Runners within the near future. We have a couple of New Recruits, but we can always use more. I’ll keep you posted on our Public Appearances and hope you’ll come on out-We’d love to meet you.